Healthcare information technology stocks proved to be some of the biggest beneficiaries of Obamacare in 2015. Here's why. The ongoing implementation of the Affordable Care Act, or Obamacare, has continued to dramatically reshape the American healthcare landscape in 2015. However, this year has proven to be another difficult one for investors trying to parse Obamacare's various mandates and stated goals to generate market-beating returns. The problem is that Obamacare hasn't affected the industry in a predictable manner since it was first signed into law. Starting this year, for instance, some hospitals have run into serious trouble with staffing levels and costs associated with broader insurance coverage among low-income patients. Furthermore, the much-maligned 2.3% levy on medical devices, that was temporarily suspended this week, hasn't wrecked nearly as much havoc on the U.S. med tech industry as some originally feared. Obamacare's goal of lowering the cost of healthcare in the U.S. through the broader use of electronic health records, though, is one aspect that has more or less gone according to plan. The transition to digital health records and billing systems has been proving to be a vital tool in the fight against costly medical errors, Medicare and Medicaid fraud, and unnecessary medical procedures. So, it's little wonder that companies with deep roots in the healthcare information technology space, such as athenahealth (NASDAQ:ATHN) and Allscripts Healthcare Solutions (NASDAQ:MDRX), have turned out to be some of the best-performing Obamacare stocks this year. Armed with this insight, let's take a deeper look at why these two companies have stood out from the crowd and what may be in store for investors moving forward. Keeping track of patients from the moment they first require medical attention until the time they are discharged from the hospital is a daunting task. That's where companies like athenahealth come into play. What athenahealth does in a nutshell is provide a broad range of information technology services for the entire continuum of healthcare, from acute care all the way to home-based services. The magic that allows the company to provide a seamless and integrated healthcare experience is its cloud-based platform known as athenaNet. By having a user-friendly system that spans the entire range of healthcare services in place, athenahealth helps to improve the quality of care and reduce costs at the same time. The bottom line for investors is that athenahealth's digital medical records platform has helped to drive the company's sales up by around 23% this year, and analysts think sales will grow by another 20% next year, making it one of the fastest-growing healthcare companies right now. That being said, athenahealth's stock is anything but cheap. At present, the company's shares are trading at a forward price-to-earnings ratio in excess of 90, implying that most, if not all, of this projected top-line growth is already baked into the stock's price. Like athenahealth, Allscripts is focused on developing integrated digital platforms, such as its Sunrise electronic health record solution, that ties several medical services into one system, with the overarching goal of improving the quality of care and lowering costs. Besides operating a growing business in the U.S. that's benefiting from this major push to digitize patients' records, Allscripts also has a substantial global footprint, offering services in 11 countries in total. In the third quarter, Allscripts reported that it successfully added a handful of major new clients in both the U.S. and the U.K. for its electronic health record segment, helping to increase the company's year-over-year sales by 3% for the three-month period. While that's not an eye-popping amount of growth, Allscripts' revenue is projected to rise by another 5.5% and its earnings per share by 26% in 2016. As a result, its stock is currently trading at a forward price-to-earnings ratio of around 25, implying that Allscripts' shares appear to be relatively cheaper than many of its peers in the burgeoning healthcare information technology space. 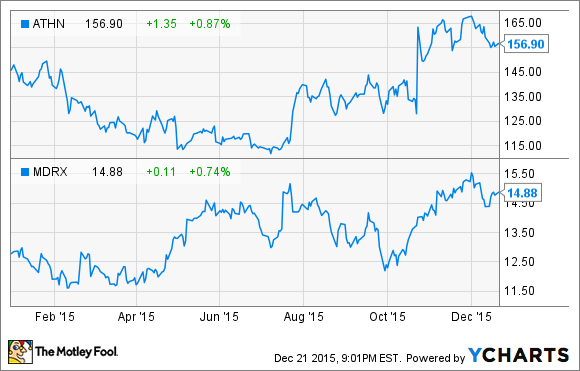 Are these two stocks good buys moving forward? Although the ultimate fate of Obamacare still hangs in the balance, the industrywide push to transition to electronic records is probably going to continue regardless. After all, doctors, hospitals, payers, and patients all stand to gain from digital platforms like athenaNet and Sunrise because they simplify the process of providing a wide diversity of healthcare services. That's why these two stocks should be able to provide investors with dependable levels of growth moving forward.